• PLOT SUMMARY: "Run" Pt. 1 - GUEST-STARRING WOLVERINE! On the loose from an Arctic research facility and pursued by a mysterious alien agent, Venom is headed to civilization. 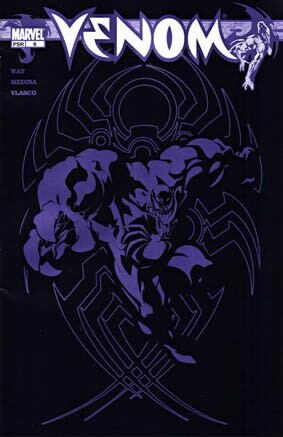 Hungry and craving adrenaline, Venom sets his sights on a tasty little snack – a short, hairy Canadian guy with a bad temper... Issue #6 (features metallic ink on black cover!) Written by Daniel Way. Penciled by Paco Medina. Cover art by Paco Medina.